Further, it is ordered, that there shalbe ffoure Courts kept eury quarter, 1, att Ipswch, to which Newberry shall belonge; 2 att Salem, to wch Saugus shall belong; 3 att New Towne, to wch Charlton, Concord, Meadford, & Waterton shall belonge; 4th, att Boston, to wch Rockbury, Dorchestr, Weymothe, & Hingham shall belonge. Eury of their Courts shallbe kept by such magistrates as shal[lbe] dwelling in or neere the said townes, & by such other psons of worth as shall from tyme to tyme be appoyneted by the Genrall Court, soe as noe Court shalbe kept without one magistrate att the least, & that none of the magistrates be excluded, whoe can & will i ntend the same; yet the Genrall Court shall appoynet wch of the magistrates shall specially belonge to eury of the saide Court. Such psons as shalbe ioyned as assotiates to the magistrates in the said Court shall be chosen by the Genrall Court, out of a greater number of such as the seurall towns shall nominate to them ..."
So wrote George Francis Dow in his introduction to the Records and Files of the Quarterly Courts of Essex County Massachusetts (published in 1911 by the Essex Institute). Dow's introduction goes into further detail about jurisdiction, dating methods, recordkeeping, etc. Many of the records are transcribed and indexed online for your research convenience. Volumes 1-9 span the years 1636-1686, with numerous inclusions of Fairfield family members, especially John, Elizabeth, and Walter. Researchers can access the quarterly court records online through the following links to volumes divided by years as noted. If you prefer to search the text version (rather than book page images), you can select the "full text" option on each volume's web page. Volume 9 / 1683-1686: Online image available on the University of Virginia website: http://salem.lib.virginia.edu/Essex/index.html. You will have to copy and paste their URL address into your web browser (e.g. google) to access the site, because my web server will not allow direct access due to the misconfiguration of their website. Keep in mind when you look at the dates in the court records that "previous to the adoption of the Gregorian calendar to take effect September 2, 1752," as Dow explains, "the month of MARCH WAS THE FIRST MONTH OF THE YEAR and double-dating prevailed between January 1st and March 24th inclusive, in each year, so that 21:12:1656-7, when modernized, should read February 21, 1657." 1638: Fairfield property in Charleston, MA, referred to as boundary of George Bunker property and others. 1638: John Fairfield granted liberty to buy John Baker's house in Salem. March 27, 1643 (March 1670 court record): John Fairefield's house boundary in Ipswich, MA, referenced. December 26, 1643: John Fayrfield fined 30s for "attempting the chastity of wife of Goodman Goldsmith." According to Lisa Lauria of the University of Virginia in section VII. of her interesting article on Sexual Misconduct in the Plymouth Colony, this wording indicated an attempted act or proposition of adultery. September 10, 1645:"brother Fairfield" presented nuncupative will of Frances, then wife of Robert Hawes. Frances was almost certainly John's sister, as her child Robert Edwards (from her first marriage) later refers to John as "Uncle" An additional sibling relationship to Frances (and thus to John, as well) is inferred by the reference in her will to "Elin Hilles, her sister in owlde England." September 9, 1646: "John Fairefilde" presents inventory of widow Mary Hersome of Wenham. Only known autograph of John appears on this original document, according to Wynn Cowan Fairfield. December 11, 1646: John Fairfield writes will in Wenham, MA. He dies between then and December 23, 1646, when an inventory of his estate was taken. The will was proven in courtJuly 6, 1647, by Robert Hawes & William Fiske and sworn to in court July 7, 1647, by widow Elizabeth Fairfield. Click here for text version and image of will. July 7, 1647: Appears in court to swear to inventory of John Fairfield estate. 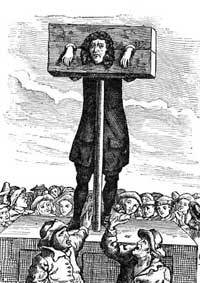 Given the strict laws governing daily life in 1600s Massachusetts, a person could easily find himself whipped or put in the stocks for what seems today a minor offense. For instance, in court held at Salem November 1 & 2, 1639, "Barbery, wife of [Edw. Waste Book] Clark, to be whipped for unchaste words, etc. ; and is not to haue to doe wth this man Joans. Joans (who is a married man) to be set in stocks and fined 10li for his carriage with the said Mrs. Clark. Neglect to pay, to be severely whipped." In defense of the court, it must be said justice was sought and found by many citizens who had been wronged. In court held at Salem January 30, 1641, "James Smith, Jr., for stealing two fishing lines, to return twice as many lines and pay 20s for loss of owner's time." The court later became famous for its Salem Witch Trials, which occurred in the late 1600s. According to Wynn Cowan Fairfield, "Walter Fairfield was a leading figure in the life of Wenham [MA]: member of the jury at County Court of Salem June 25, 1667; served on committees in Wenham as early as Nov. 8, 1667; kept an 'ordinary' at Wenham, licensed 1680 and 1686 (an evidence of public trust in those days); treasurer and constable, 1676; selectman several times 1668-1709; sergeant, 1683 and Ensign, 1695; representative to the General Court in 1692 and 1700; moderator of town meeting, Wenham, 1706-1709; signed petition to the king, 1675 and represented Wenham 1689 in moves to secure restoration to the Massachusetts Bay Charter and of the General Court, after restoration of William and Mary, Called 'yeoman' and 'turner.' Involved in many litigations, some involving rather violent outbursts of language and action." November 1660: Court forbids Richard Coy from using any timber on heirs' land except for housing and fencing. November 1660: Review of father's estate division between sons, custody of Peter Palfrey, etc. June 1661: "Walter Fairefeild" vs. Richard Hutten for withholding from him a parcel of land. Verdict for defendant. November 1664: Walter and John Fairfield v. Richard Coy. Verdict for defendant. September 1665: Walter Fairefield fined for abusing Richard Coy's wife and children with words and blows. November 1670: Walter "Fayerfeld" deposed, aged about thirty-eight years. June 1672: Charges of trespassing against Walter. Withdrawn. October 1672: Report filed of jury of inquest, on which Walter was member. Report dated June 29, 1672. June 1673: Walter "Fearfeeld" for detaining or not requiring his servant, Jno. Besoon to attend the public worship of God on the Lord's day, was admonished. March 1674: Writ submitted by Walter Fayerfield [w/autograph], builder of sawmill. March 1678: Walter Fairefield v. Mr. John Giffard. Slander. Verdict for plaintiff. June 1678: Walter Fayerfield, aged about 48, deposed regarding land. November 1679: Sarah Needham, daughter of Walter, suspected of fornication. Walter bound for her appearance at the next Ipswich court. May 1680: Reason for appeals recorded February 9, 1680, relating to the committee of militia and the impressment of saddles and pay. September 1680: John Dodge v. Walter Fairefield et al. for wrong and injury done to his wife. Verdict: guilty. March 1681: Walter Fairefield licensed to keep an ordinary* *Descendants can join the Flagon and Trencher Society. November 1682: Walter Fairefeild v. Thomas Fiske appeal re: false oath. Reversion of judgment in favor of Walter. June 1683: Walter Fairefeild's petition for continuing his license was not accepted. November 1672: John "Farefield's" widow Sarah (Geare) presents inventory of John's estate. November 1673: Marriage recorded of Daniell Killim and Sarah Fairefild April 13, 1673. November 29, 1660: Chose Peter Palfrey for his guardian upon mother's death. November 1664: Lease dated May 24, 1658 declares July 21, 1666, as date Matthew will be eligible to inherit. June 1681: William Faierfeild, aged about 18 years, deposed. June 1673: inheritance of John "Feirefeild" put in trust of stepfather Daniel Killam until of age. November 1667: birth recorded of Trypheana, daughter of John Fairfield, on April 6, 1667. June 1673: inheritance of "Trifana" put in trust of stepfather Daniel Killam until of age. June 1673: inheritance of Elizabeth put in trust of stepfather Daniel Killam until of age. July 1667: Wenham burial recorded of Benjamin Fairfield, son of Walter Fairefield, Sept. 14, 1668. June 1679: Sarah Needham and Phillip Parsons, for fornication. June 1681: Sarah presented for fornication, found to have borne a child, and fined (warrant dated June 29, 1681). November 1666: record of births for Wenham shows Elizabeth, daughter of Walter Fairefield, born August 9, 1666.